Coming up on Ault Park, a fuchsia sunrise is under way. I checked the forecast last night and was surprised to see that the entire week is expected to be overcast and gloomy. It appears our streak of beautiful clear autumn skies is officially over as we break into the winter season. With last week being mostly filled with cloudy and wet mornings, it appears that this week will be no exception. This isn’t to say that there may not be a surprise or two hidden in the weather pattern, however. The forecast has been particularly shaky over the course of this season transition so I wouldn’t be surprised to find that there may be some gems hidden in the upcoming week. Even a slight break in a cloudy pattern can make for a spectacular sunrise because of the unpredictable dynamics that a cloudy sky provides. This morning, however, was the only day for the entire week that there was an expectation of relatively clear skies. The forecast said 19% cloud cover which is a great bet considering that I can get lucky with up to 60% cloud cover. I went to bed looking up at a clear sky and woke up to a dark gray atmosphere of the kind you’d expect to be brooding a winter storm. I was a bit disappointed, but seeing as how today is Free Coffee Refill Day @ UDF (every Monday!) I decided to check it out anyway in the hopes that something may change. Interestingly enough, Mt. Lookout Square is kind of in a valley so it can be hard to judge what the distant horizon is up to without actually getting up to Ault or Alms Park. By the time I was leaving Mt. Lookout Square, the sky had shown no signs of light and the sunrise time was just around the corner. I took the “long way” to Ault Park, up through some extra neighborhood hills just to keep my cardiovascular system in check as we head into winter hibernation. 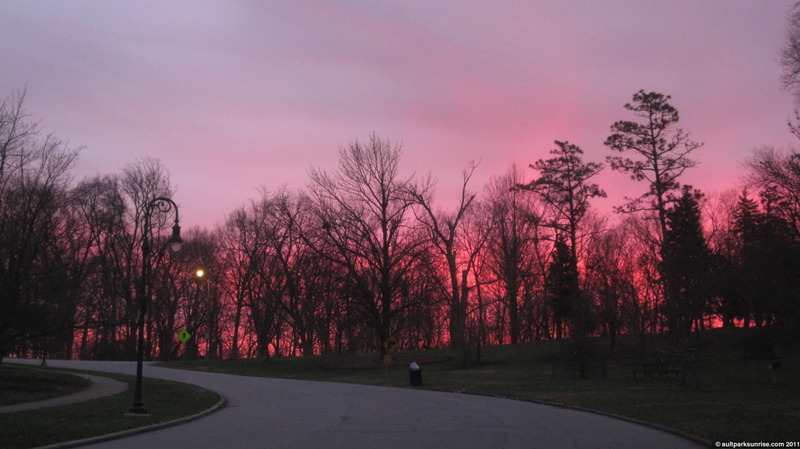 Once I passed the Cincinnati Observatory, however, I could see that the eastern sky was up to something. 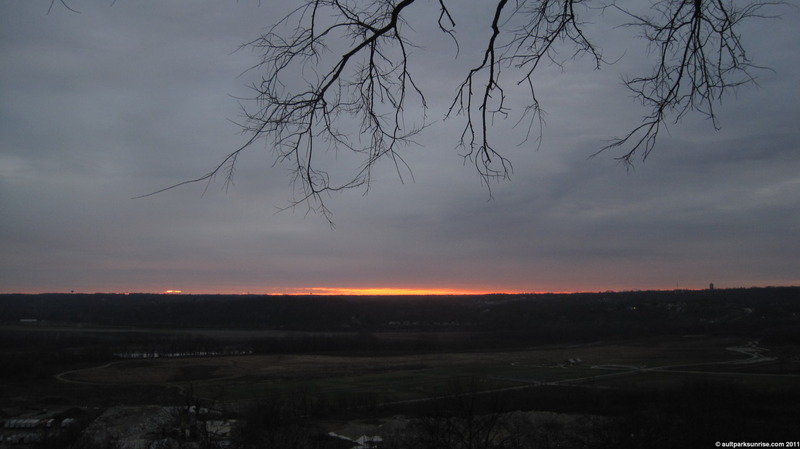 The bare trees provided a view that suggested that it was time to high tail it up to the overlook. I dropped the trusty old Fuji into high gear (OK second gear, who am I kidding with these hills) and pressed onward to the overlook hoping that I wouldn’t miss the show. As it turned out, the eastern horizon was beginning to light up in a magnificent shade of fuchsia unlike one that I’ve seen so far in this project. A rare sight, indeed. The pictures unfortunately do not do it justice because it was as if the entire lower atmosphere was ablaze with a hot pink fire. The color did not spread into the upper atmosphere and was contained by the breaking cloud front that only temporarily was giving up control of the eastern sky. There was a faint mist across the Valley that served to accentuate the bright light. 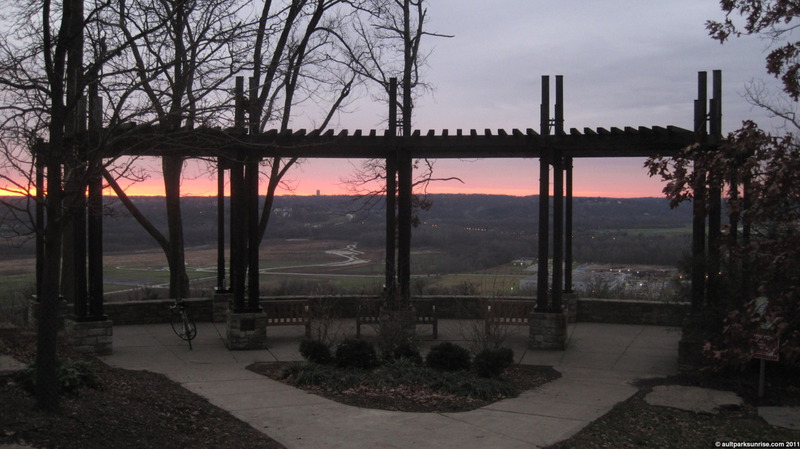 I arrived at the overlook in time, and just as quickly as the fuchsia show arrived, it dwindled into a muted gray/orange sunrise. 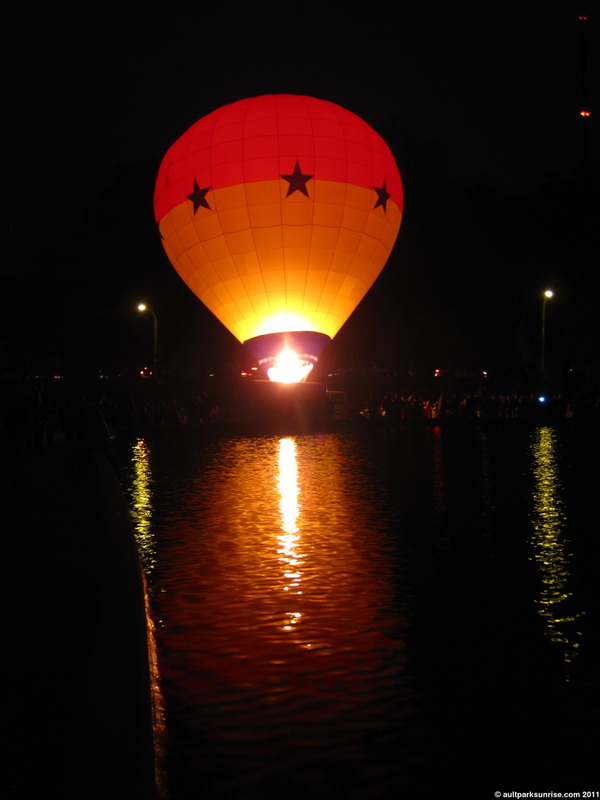 As a completely unrelated note, while I was going through the pictures on the camera I realized that I had forgotten to include some documentation from a recent Hot Air Balloon Festival (Balluminaria) at Eden Park. I was hoping to get back up to Eden Park to continue the exploration of the reservoir ruins, but it hasn’t happened yet. Rather than wait for that to happen and include the pictures there, I’m posting the pictures along with Sunrise 130. 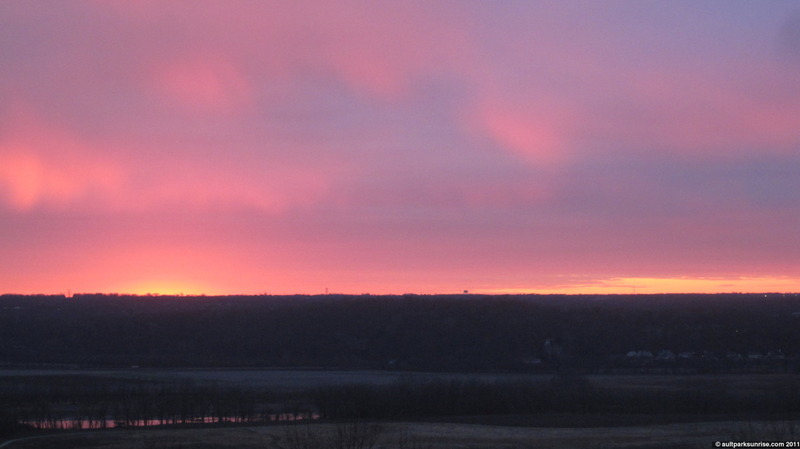 The pictures can’t do it justice, the colors were radiant this morning. Just before “first light” during the fuchsia sunrise. As the sun rose up it was blocked by a low lying cloud bank (you can see a sliver of the sun to the left of the picture). As quickly as it came, the fuchsia sunrise was gone. This was our first time attending the Balluminaria and it was a neat thing to partake in. 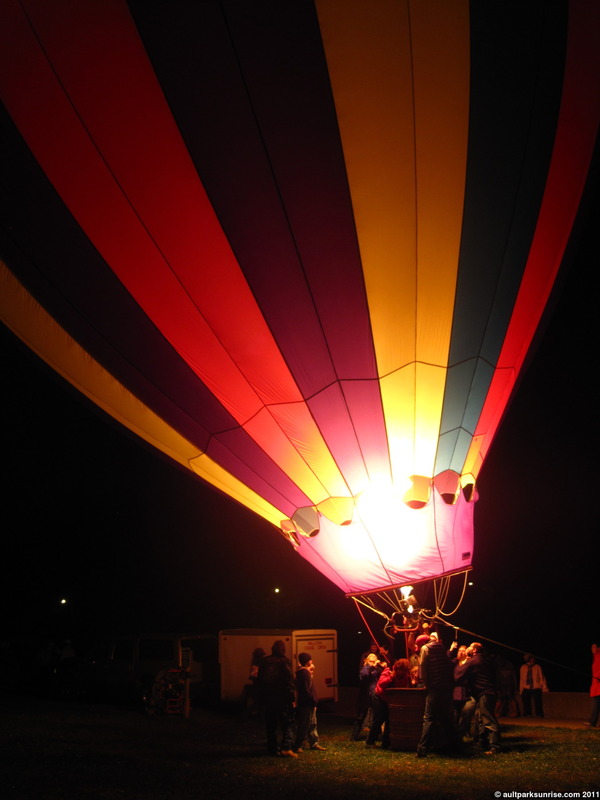 The balloons lit up as dusk settled in. It was pretty crazy to see the thousands of people descent on Eden Park for the event that took place November 17 2011. 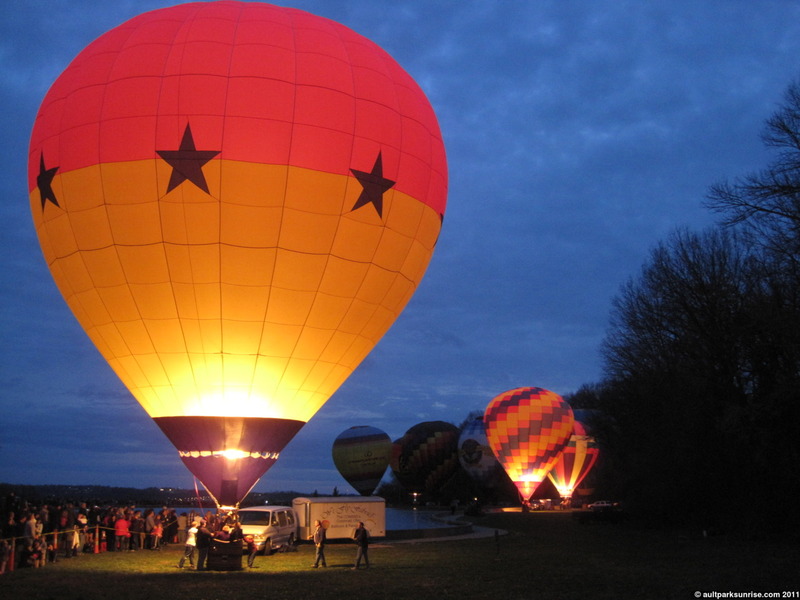 I’m not sure if they have two separate fuels, one for hot air and one for light, but there was a distinct difference between the flames that kept the balloons inflated and the flames that lit up the canopy. 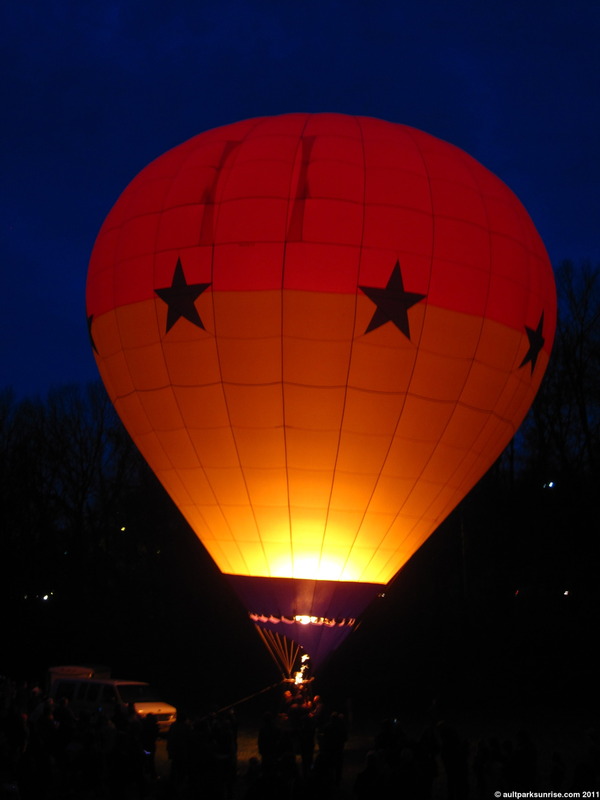 When the air horn blasted, the balloons were lit up in bright flashes of orange. There were literally thousands of people present, and hundreds of cameras ready for the show. 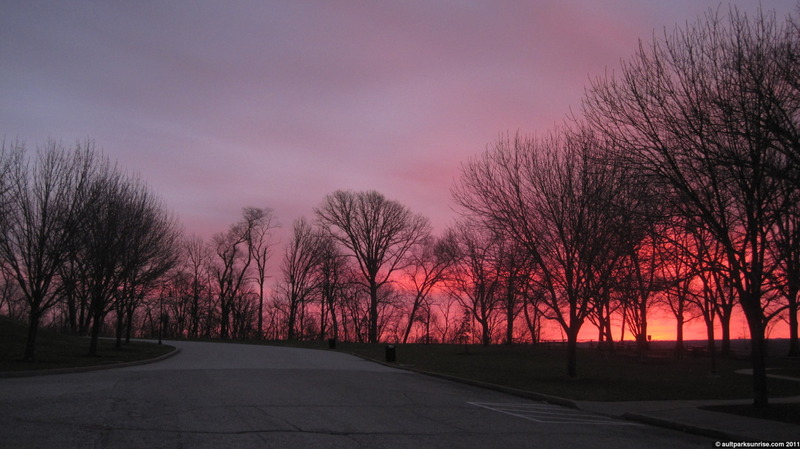 This entry was posted on December 19, 2011 by Ault Park Sunrise. It was filed under ault park, overcast, sunrise and was tagged with ault park, autumn, cincinnati, eden park, hot air balloons, sunrise. Today was definitely one of those days where I was bummed to be driving west in the morning. I kept watching the sunrise in my rearview mirror and it was absolutely gorgeous! Indeed! Too bad we probably won’t see the sun for another 5 days! Thanks for stopping by Rachel!